I'm sure I've mentioned before that Jellybean is my little helper around the house. She wants to help with everything from cleaning to cooking. I'm really excited to see how that plays out with her new baby brother. He'll be here any day now. 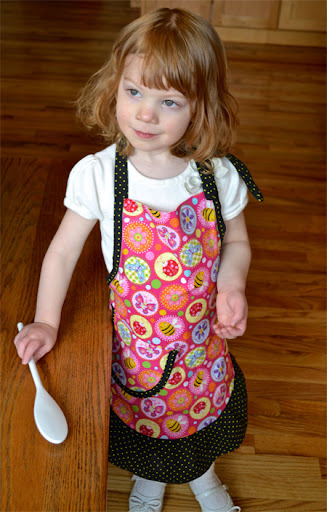 For her birthday, my mom gave her a jr. cooking set and made her the sweetest apron. Even better, my mom made me a matching apron as well. I can't wait to have this baby and be able to wear our aprons together. Look at that perfect little apron. She even has room to grow into it. Note: you will not see me wearing mine until my belly no longer sticks out a mile. Because Jellybean is so interested in helping me in the kitchen, I've been making some forays into cooking and baking with her. It isn't easy and frankly pretty frustrating, but it's fun to see her light up. She clearly enjoys it. Mixing the dry ingredients with her whisk. 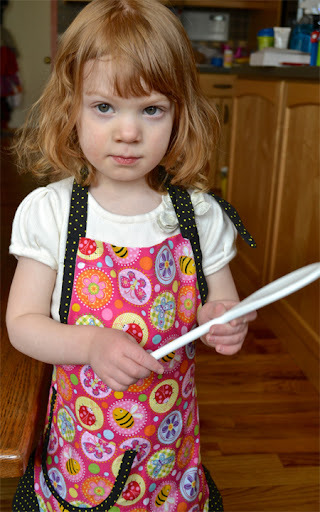 What other cooking skills do you think a 3 year old can be learning right now? I'm a little stumped. 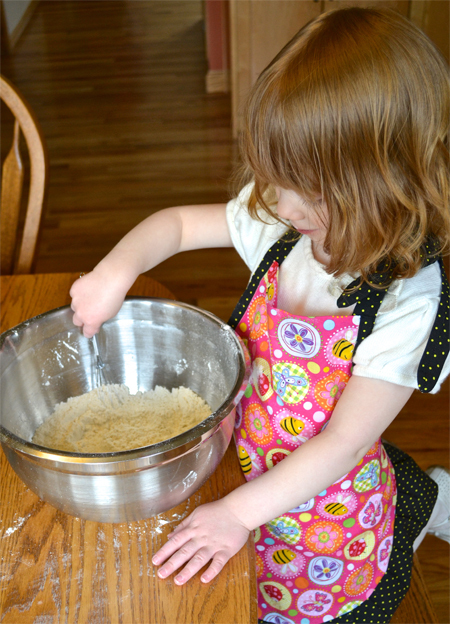 I suppose pouring and mixing will probably keep her pretty occupied for now.